To Cite: Guo Y, Wang L, Lei J, Xu J, Han L. Antimicrobial and Antibiofilm Activity of Human Cationic Antibacterial Peptide (LL-37) and Its Analogs Against Pan-Drug-Resistant Acinetobacter baumannii, Jundishapur J Microbiol. 2017 ; 10(3):e35857. doi: 10.5812/jjm.35857. Background: Human cationic antibacterial peptide hCAP18/LL-37 is the only known cathelicidin, which is part of the innate immune system of humans. The antimicrobial activity of LL-37 against multi-drug-resistant Acinetobacter baumannii has been reported recently, however, whether LL-37 and its analogues (LL/CAP18 and FF/CAP18) have antimicrobial activity against pan-drug-resistant Acinetobacter baumannii (PDRAB) is still unknown. Objectives: This study aims to clarify the antimicrobial activity of LL-37 and its analogues against PDRAB. Methods: In this study, we evaluated LL-37 and its truncated analogs inhibitory effect on the growth of PDRAB by minimum inhibitory concentration (MIC) and minimum bactericidal concentration (MBC) analysis, we also examined the effect of LL-37 and its analogs on bacterial biofilm formation by using a quantitative crystal violet assay. Results: LL-37 and its truncated analogs were effective in inhibiting the growth of PDRAB and had a rapid killing ability. After exposure to the peptides, the development of the PDRAB biofilm was inhibited. Strong inhibitory and dispersion effects of FF/CAP18 on the biofilm were confirmed by fluorescence microscopy and field emission scanning electron microscopy. Conclusions: This results show that FF/CAP18 is a potential antimicrobial agent for treating pan-drug–resistant bacterial infections. Acinetobacter baumannii, a Gram-negative bacterium, is a nosocomial pathogen occurred in hospital acquired infections or patients with major trauma, burns, or suppressed immunity (1-4). Due to the abuse of antibiotics in normal treatment of bacterial infections, pan-drug-resistant A. baumannii (PDRAB) infections have become a significant public health threat (5, 6). The first report of PDRAB emerged in 2001, and this bacterium caused a nosocomial outbreak in 2002 in Spain (2). Since PDRAB can easily adopt resistance, these infections are difficult to treat (5). Moreover, the formation of biofilms by A. baumannii, especially the strain isolated from the wounds, bloodstream, and catheter-induced infections, may contribute to bacterial survival in hospitals (7, 8). Thus, there is an urgent need to develop novel and effective antimicrobial agents against emerging PDRAB. The antibacterial peptide LL-37, an 18-kDa peptide with 37 amino acid residues, is the only member of the cathelicidin family identified in humans, and it plays an important role in the first line of immune defense (9). LL-37 expression is high in many tissues and body fluids, such as saliva, sweat, and seminal plasma (10, 11). LL-37 exhibits a broad spectrum of antibacterial, antifungal, and antiviral activity. Feng et al. reported the antimicrobial effect of LL-37 and its fragments on multi-drug-resistant A. baumannii (12). However, the effect of LL-37 against PDRAB infections was still unknown. Moreover, it has been reported that the antimicrobial effect of LL-37 peptide can be enhanced by replacement with hydrophobic and cationic amino acid residues (13, 14). Here, we designed 2 truncated analogs of LL-37, LL/CAP, and FF/CAP18, which have the enhanced positive charge compared with LL-37. Therefore, in this study, LL-37 and its 2 truncated analogs were tested to determine their effects on PDRAB. Specifically, we examined their effects on biofilm formation and stability as well as antibacterial activity (i.e. growth inhibition and viability), after exposing bacteria to the peptides. Ten PDRAB strains were recovered from skin swabs of 10 separate patients with wound infection at the First Affiliated Hospital of Xi’an Jiao Tong University following with the guidelines from the centers for disease control and prevention (CDC) (15). Pan-drug resistant A. baumannii strains were grown at 37°C in brain heart infusion (BHI, Difco, USA). The study was conducted according to the ethical standards of the Declaration of Helsinki and was allowed by the Ethics Committee of Medicine School in Xi’an Jiao Tong University (XJTU2015-028). The synthesis of the peptides were followed with Isogai’s method and based on the sequences shown in Table 1 (16). The purified peptides were obtained through a YMC-A 302 column by using reverse-phase high-performance liquid chromatography (Model LC-8A, Shimadzu Corporation, Japan). Furthermore, the purified peptides were further confirmed by mass spectrometry and suspended in Hanks’ balanced salt solution (Gibco, USA). The optical density of overnight-cultured bacteria was measured at 595 nm. The optical density was then adjusted to 0.02 by adding BHI. One milliliter of peptide solution and 1 mL of adjusted bacteria culture were then mixed and incubated at 37°C for different times. Then, 100 µL of the mixture was removed and inoculated onto BHI agar plates for culture overnight at 37°C, the concentration of each peptide was determined at the number of CFU (17). Adopting unprocessed bacterial suspension as a standard, the minimum inhibitory concentration (MIC) was defined as the lowest concentration that prevents the growth of 90% of the immunization, and the minimum bactericidal concentration (MBC) was described as the lowest concentration at which < 99.99% of the initial inoculum is feasible. Due to the lack of PDRAB standard strain, we used the No. 5 clinic-isolated strain in the following experiments. The PDRAB suspension (5 × 105 cells/mL) was inoculated into 100 µL of sodium phosphate buffer (PBS) in the present or absent LL-37, LL/CAP18 or FF/CAP18 at different concentrations and cultured aerobically at 37°C for 1 hour. Then the bacterial mixture was plated onto BHI agar plates with appropriate dilutions. To measure the short time killing effect of each pepetide, the number of CFU were counted. Untreated bacteria were used as a 100% live control. Biofilm formation of PDRAB was quantitatively measured by crystal violet assay on 96-well plates described previously (18, 19). Briefly, optical density of overnight cultured bacteria was adjusted to 0.02 by adding BHI. Two-hundred microliters of diluted bacteria were co-cultured with 20 µL of different concentrations of the peptides in 96 well plates. The minimum biofilm eradication concentration (MBEC) plate lid was placed on top of the 96 wells plate and was shaken for 24 hours. The pegs were then detached from the lid and washed with 200 µL of phosphate-buffered saline (PBS) to detach non-adherent cells. The adherent biofilms that were located on the pegs were fixed with 200 µL of 100% ethanol, stained with 200 µL of 0.41% (w/v) crystal violet in 12% ethanol for 2 minutes. To remove excess stain, the pegs were then washed several times with PBS. The adherent biofilms were obtained by immersing pegs in 200 µL of 100% ethanol at room temperature for 10 minutes. The formation of biofilm was finally evaluated by measuring the absorbance at 595 nm as described previously (20). To measure the preformed biofilms susceptibility of PDRAB, the adherent biofilms were grown on the MBEC pegs under shaking conditions for 24 hours. The pegs were then transferred to a new 96 well plate and co-incubated with different concentrations of peptide for 1 hour at 37°C. Furthermore, the adherent cells were fixed with ethanol, stained with crystal violet, washed with ethanol, and then measure for absorbance. To obtain images of peptide disruption on the membranes of PDRAB, the bacteria were treated with 8 µg/mL FF/CAP18 for 1 hour. Then, the treated bacteria were washed with PBS 3 times, and then incubated in a 1:1 mixture of Live/Dead BacLight Bacterial viability assay for 15 minutes. Finally, the images were observed with a fluorescence microscope. To image the antibiofilm effect of FF/CAP18 on PDRAB biofilm formation and preformed biofilms, the MBEC peg was used. The Pegs were collected from the MBEC assay that was performed as described above, and then washed with 0.9% saline for 1 minute to detach non-adherent bacteria. The pegs were fixed with 2.5% glutaraldehyde in 0.1 M cacodylic acid at 4°C for 16 hours. Then, washed with 0.1 M cacodylic acid and distilled water for 10 minutes. At last, the pegs were fixed with 70% Ethanol for 15 - 20 minutes and air-dried for least of 24 hours. The pegs were images by FE-SEM (SU8000; Hitachi High-Technologies Corporation, Japan). Three independent experiments were performed in each batch of planktonic cells and for the biofilm reduction assay of PDRAB. The results are presented as means ± standard deviation. The p value was calculated using Dunnett’s test. In the antimicrobial killing assay, the MICs of FF/CAP18 on PDRAB ranged from 8 to 16 µg/mL. 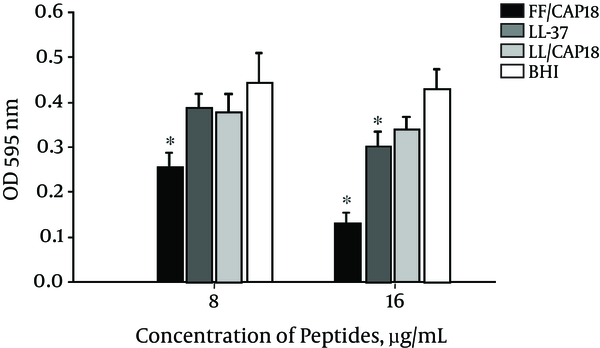 The MICs of the other 2 peptides ranged from 32 to 64 µg/mL. 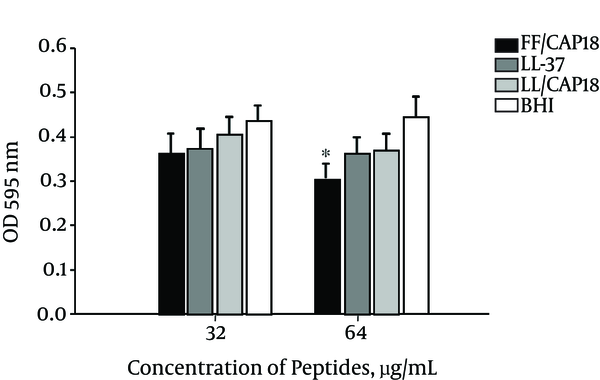 FF/CAP18 had a lower MBC value than those of the other peptides (Table 2). As shown in Figure 1, LL-37 and its truncated analogs exhibited a dose-dependent bactericidal effect against PDRAB after 1 hour. FF/CAP18 killed 100% of the tested bacteria at 16 µg/mL. LL-37 and LL/CAP18 caused a 100% reduction of viable bacterial cells at 64 and 128 µg/mL, respectively (Figure 1). The short-time antibacterial ability of FF/CAP18 was confirmed by Live/Dead fluorescence staining (Figure 2). 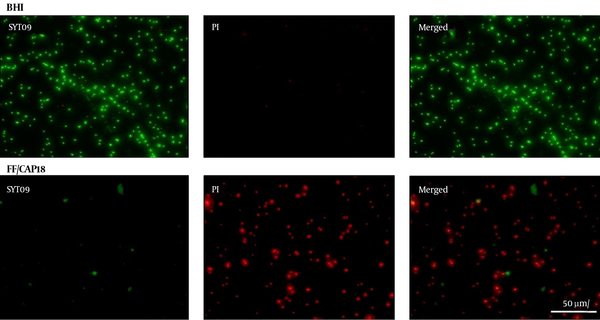 The viable bacterial population showed strong green and weak red fluorescence when grown in BHI medium, while PDRAB showed weak green fluorescence and strong red fluorescence in the presence of 8 µg/mL of FF/CAP18. These results suggested that bacterial membrane integrity would be lost after exposure to FF/CAP18. aValues are expressed as means of three independent experiments. bFor each experiment, 10 bacterial samples isolated from 10 different patients were used. Three independent experiment were performed and presented as means ± SD. * means the significantly different from the untreated controls (P < 0.05). Cells were analyzed with fluorescence microscopy. After incubation with FF/CAP18 (8 µg/mL) or BHI medium alone for 1 hour, the bacterial cells were stained with SYTO9 (green) and propidium iodide (red). Bacteria exhibiting red fluorescence are considered as dead cells. Considered bacterial biofilm is an important virulence factor, the formation of a biofilm by PDRAB was measured after treatment with LL-37 and its truncated analogs. Biofilm formation was quantitatively evaluated by crystal violet staining of MBEC pegs attached to the lid. 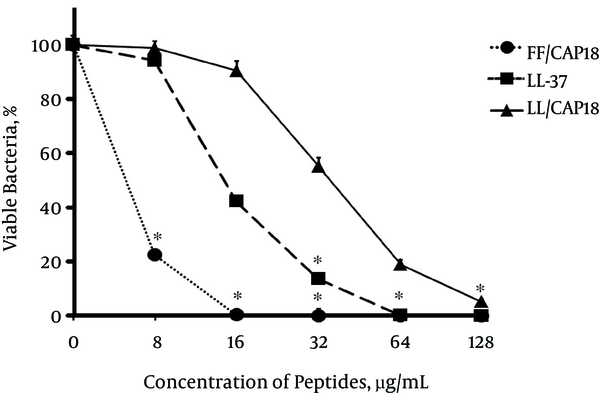 The formation of biofilm formation was inhibited by all 3 peptides at a concentration of 16 µg/mL (Figure 3). FF/CAP18 had the strongest inhibitory effect at 8 µg/mL (P < 0.05). FF/CAP18-treated samples showed fewer adherent bacteria on pegs, and the cell membrane was rough (Figure 4). Standardized cultures of pan-drug-resistant Acinetobacter baumannii were grown on MBEC pegs overnight at 37°C in the present and absence of peptides. Adherent cells on pegs were then fixed with ethanol, stained with crystal violet, washed with ethanol, and the absorbance was determined at 595 nm. Three independent experiment were performed and presented as means ± SD. *Means the significantly different from the untreated controls (P < 0.05). The pictures show the surface of bacterial cells captured by field emission scanning electron microscopy. A and B, PDRAB incubated in BHI medium for 24 hours; C and D, PDRAB treated with FF/CAP18 (8 µg/mL) for 24 hours. In this experiment, a biofilm susceptibility assay was used to measure the inhibitory effect of LL-37 and its truncated analogs on preformed PDRAB biofilms. Performed biofilms were grown on MBEC pegs and then visible to increasing concentrations of LL-37 and its truncated analogs for 1 hour. Then, the numbers of residual bacteria were quantitatively measured by crystal violet staining. The PDRAB preformed biofilm showed the highest vulnerability to FF/CAP18 at 64 µg/mL compared with the control group. However, it showed less sensitivity in the treatment with LL-37 and LL/CAP18 at the same concentration (Figure 5). As shown in Figure 6, the conjunction of preformed biofilm was damaged by FF/CAP18 treatment. Standardized cultures of pan-drug-resistant Acinetobacter baumannii were incubated overnight on MBEC pegs to develop mature biofilms at 37°C. The pegs were then transferred to new 96 wells containing peptides for 1 hour to measure the disperse of biofilm from the pegs, and the absobance was determined at 595 nm. Three independent experiment were performed and presented as means ± SD. *Means the significantly different from the untreated controls (P < 0.05). A, Preformed PDRAB biofilms incubated in BHI medium for 1 hour; B, preformed PDRAB biofilms treated with FF/CAP18 (64 µg/mL) for 1 hour. Pan-drug-resistant A. baumannii infections have become a significant public health threat, as this pathogenic bacterium can be resistant to multiple antimicrobial agents (14, 17). LL-37 is amphiphatic, retaining both cationic and hydrophobic features, and having a broad range of antimicrobial activity both in vitro and in vivo (16, 21, 22). In order to identify a potential therapeutic agent against nosocomial PDRAB infections, we evaluated the antibacterial activity of LL-37 was able to effectively inhibit the growth of PDRAB. FF/CAP18 and LL/CAP18, truncated versions of LL-37, have more potent microbicidal activities against Porphyromonas and Prevotella species than that of LL-37 itself (16). In the short-time bactericidal effect assay, FF/CAP18 showed a high antibacterial effect on PDRAB than LL/CAP18. It may indicate that by replacement of glutamic acid and lysine residue with phenylalanine was more efficient in antibacterial activity than with leusine. In addition, FF/CAP18-treated PDRAB showed positive staining of intracellular nucleic acids with the Live/Dead staining test at short incubation times. This finding suggested that the FF/CAP18 peptide killed bacterial cells by breaking cell membrane integrity. The ability of A. baumannii to form biofilms on the surface of medical devices, such as cleaning instruments, water lines, artificial heart valves, catheters, and intubation tubes (23), contributes to its outstanding antibiotic resistance and survival properties. LL-37 has the potential to inhibit the formation of bacterial biofilms in vitro, including those from Staphylococcus aureus (24) and Pseudomonas aeruginosa (25). Feng et al. showed that LL-37 and its fragments have effective antibiofilm activity against multi-drug-resistant A. baumannii (12). 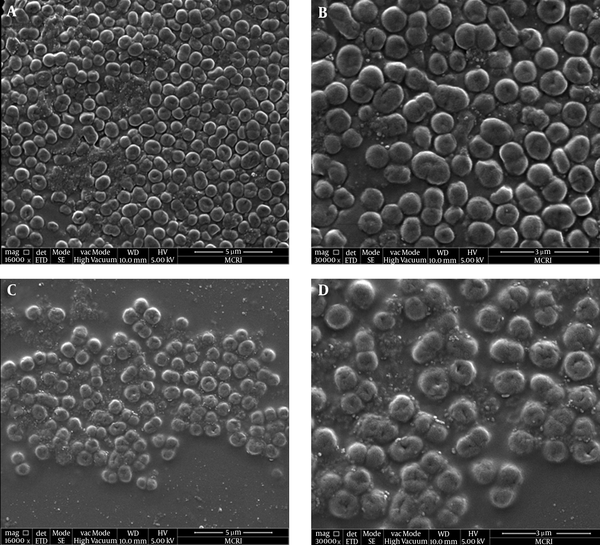 In the current study, LL-37, LL/CAP18, and FF/CAP18 inhibited biofilm formation of PDRAB. Moreover, FF/CAP18 showed exceptional activity against preformed biofilm, leading to damage of bacteria membranes in the FE-SEM experiment. We considered that the sensitivity of PDRAB to FF/CAP18 may be partly due to the binding of bacterial membrane molecules, such as peptides, to cell-surface molecules, leading to resistance to bacterial enzymatic degradation (26). However, further study is needed to verify this concept. In summary, the results show that LL-37 and its truncated analogs inhibit PDRAB and its biofilm formation. FF/CAP18 possessed the most promising antibacterial activity among the anti-microbial candidates tested in this study. Importantly, FF/CAP18 was also able to inhibit biofilm formation and induce biofilm dispersion. This study provides new information for the development of therapeutics against PDRAB infection. We are grateful to Dr. Xuesong Feng (School of Basic Medical Sciences, Xi’an Jiaotong University, China) for critically reading the manuscript. Authors Contribution: Yijie Guo participated in the microbiological analysis and drafted the manuscript. Ling Wang participated in the FE-SEM. Jine Lei and Jiru Xu performed the bacterial collection, culture, and storage. Yijie Guo and Lei Han participated in study design. All authors read and approved the final manuscript. Funding/Support: This study was supported by the China postdoctoral science foundation (No. 2015M582672), natural science basic research plan in Shaanxi province, China (No. 2016JQ8051), and Shaanxi province postdoctoral science foundation (No. 2016BSHEDZZ84).